Congratulations to Adrian Edwards (PRIME Centre Wales Director and Professor of General Practice, Cardiff University), Helen Snooks (PRIME Associate Director and Professor of Health Services Research, Swansea University) and Kerry Hood (PRIME Executive Committee member and Professor of Trials, Cardiff University) who have all been selected to be part of the new group of Health and Care Research Wales senior research leaders. "I am delighted to receive this award which reflects the achievements of my team in the Swansea based section of PRIME, focussing on prehospital emergency and primary care, their interfaces and particularly the care of vulnerable groups. The award will allow us to further invest in capacity building for research both in the academic and NHS settings, as well as ensuring opportunities for dissemination are used to maximise impact in the real world of policy and practice." Health and Care Research Wales senior research leaders will act as ambassadors for Health and Care Research Wales and play a leading role in raising the profile of health and social care research in Wales on a national and international level. 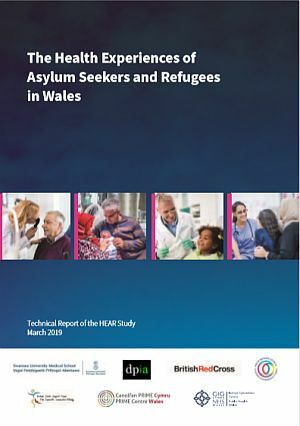 Findings from the 'Health Experiences of Asylum Seekers and Refugees in Wales (HEAR)' study led by PRIME researchers at Swansea University have been published in a new Public Heath Wales report. The study found that people seeking sanctuary, including refugees and asylum seekers, are struggling to access health and wellbeing services in Wales. People seeking sanctuary reported feeling their needs were not recognised, and that they had experienced problems navigating through services, including language difficulties and a lack of appropriate interpretation. In a survey conducted as part of the HEAR study, nearly a quarter (23 per cent) of respondents said they did not know how to contact, or had not heard of, the 999 ambulance service. Congratulations to Clare Wilkinson, Professor of General Practice at Bangor University and Associate Director at PRIME Centre Wales, who has been shortlisted in the inaugural Welsh Women's Awards 2019. Prof Wilkinson leads the North Wales Centre for Primary Care Research at Bangor University and conducts research into improving primary care and early cancer diagnosis for people in Wales. “I am honoured to be nominated among such outstanding women in Wales, it is a delight to see all the categories and the women who populate them". Making decisions about research: How can we support families? Victoria Shepherd, NIHR Doctoral Research Fellow at PRIME and CTR, Cardiff University recently hosted an event 'Making decisions about research for others - how can we support families?' held 25th March. As part of her PhD, Victoria has been developing a decision-support tool to support making decisions about research for others with impaired capacity. The aim of the event was to bring together family members, carers, researchers, research nurses and others with an interest in helping families make decision and ask them to consider the tool, and offer feedback before it is finalised. Can Machine Learning hold the key to making the most from patient safety incident reports? Improving patient safety…. the answers are in the data, but the challenge in the sheer quantity of data to analyse. Learning from patient safety incident reports is a vital part of improving healthcare. However, the volume of reports and their largely free-text nature poses a major analytic challenge. A recent study led by the Patient Safety team at PRIME Centre Wales, Cardiff University, has found that supervised machine learning can be used effectively to classify patient safety incident report categories. Health Technology Wales (HTW), an independent and innovative national body, has opened a Topic Call on St David’s Day.People are being encouraged to suggest non-medicine technologies that could improve health and social care in Wales. From clinical commissioners and frontline care providers, to patients and members of the public, anyone can suggest a topic on Health Technology Wales’ website. “Health Technology Wales will provide independent, evidence-informed Guidance on the clinical and cost effectiveness of non-medicine technologies to provide assistance to the Welsh care sector in its health technology adoption decisions,” said Dr Peter Groves, Chair of Health Technology Wales. Non-medicine technologies can include; devices and diagnostic tests, implants, surgical procedures, psychological therapies and changes in treatment pathways. Topic referrals can also reflect the priority areas of the Welsh Government. Health Technology Wales is currently planning its 2019 work programme to support a strategic, national approach to the identification, appraisal and adoption of non-medicine health technologies into Welsh health and social care settings. PRIME Centre Wales staff will continue to have ongoing involvement with the Health and Care Research Wales Speciality Leads following the recently completed recruitment process for 2019-21. Professor Ivor Chestnutt (PRIME lead for Oral and primary dental care) who continues in the role as Speciality Lead for Oral and dental heath. Specialty Leads in Wales provide important strategic support as part of the Health and Care Research Wales Support & Delivery Service, building networks of principal investigators within their specialty and supporting the uptake of studies throughout Wales. They map onto the 30 National Institute for Health Research (NIHR) therapeutic areas and provide strong UK-level engagement for Wales. The WICKED research team, based at Bangor University, won the prize for the best scientific poster at the CRUK Early Diagnosis Conference in Birmingham 12th to 13th February. The poster entitled "Development of a primary care behaviour change intervention to expedite the diagnosis of symptomatic cancer in Wales a multi-dimensional approach" presented by Stefanie Disbeschl, illustrated an overview of the work on the research programme to date. 'This is a terrific prize for the team to win, and a reflection of the quality of the research programmes to date, and the upcoming primary care feasibility trial. Our goal is to improve cancer diagnosis through primary care in Wales. We are indebted to Cancer Research Wales for their funding, and for the support of PRIME Centre Wales'. Read more about the WICKED study here. The research team pictured opposite (left to right): Rebecca-Jane Law, Stefanie Disbeschl, Julia Hiscock, Ruth Lewis and Maggie Hendry). The Welsh Institute for Health and Social Care (WIHSC) are seeking to appoint an enthusiastic and committed candidate to the post of Senior Research Fellow. The post-holder in this important position will make substantial contributions to research, publication and income generation aligned to the research and evaluation activities of WIHSC and the School of Care Sciences. The post-holder will be expected to contribute to the University’s REF submission and have a track record of income generation and publications, having completed their PhD in a relevant area in recent years. They will possess a breadth and depth of specialist knowledge in the field of health and social care policy, commissioning and provision across the statutory, independent and third sectors within Wales and the UK. The PhD will involve: i.) Literature reviewing and critical appraisal of current evidence; ii.) Epidemiological research methods using routinely collected data; iii.) Qualitative interviews with individuals accessing PrEP through sexual health clinics; iv.) Causal modelling methods. The student will join a research team that crosses the disciplines of public health, statistics, sociology, and systematic reviews. Research students are all members of Cardiff University’s Graduate College, which exists to foster an intellectually stimulating environment where students are encouraged to share and develop research interests with peers from other Schools and to feel part of a wider cross-disciplinary research community. The student will also spend time at the partnership organisations gaining considerable experience of HIV and sexual health from both public health policy and advocacy perspectives. Dental amalgam has been the primary material for the restoration of cavities resulting from dental decay for well over a century. The material is durable, safe, easy to use and has been the bedrock of tooth restorations in dental practice for many generations. However, increasing concerns over the effects of mercury on the environment, (mercury release from crematoria being a particular concern), has seen legislation being enacted by the European Union to phase out the use of dental amalgam. The study reported in the British Dental Journal describes the state of preparedness of general dental practitioners in Wales in relation to these changes and their perception of the use of alternative plastic (white) filling materials. The study was funded by PRIME’s predecessor body, the Wales School for Primary Care Research. The International Council of Nurses (ICN) and the Nursing Now campaign are delighted to support the endorsement by the World Health Organization Executive Board (WHO EB) to designate 2020 as the Year of the Nurse and Midwife. The recommendation was made yesterday evening in Geneva by Dr Tedros Adhanom Ghebreyesus, Director-General of WHO. The proposal will go to the World Health Assembly in May for its consideration. A better understanding of risks and causes of harm for out of hours palliative care is urgently needed to ensure patient safety, a study conducted by the patient safety team at PRIME and funded by terminal illness charity Marie Curie and the RCGP has found. Following on from the DECISION Study, a decision support intervention is being developed to help family members make a decision about research participation on behalf of someone who lacks capacity to consent. We are holding an event to discuss the prototype tool and gather feedback in order to further refine it. It is a half day event on the morning of Monday 25th March in Cardiff, and we are inviting those with experience as researchers in this area, and those with lived expertise as families of someone living with dementia, to join us. 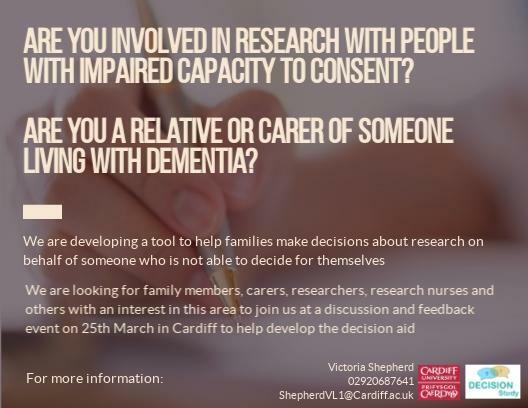 If you have been involved in research with adults who lack capacity to consent, or are a family member of someone living with dementia, please contact Vicky Shepherd (ShepherdVL1@cardiff.ac.uk ) for more details or to register an interest in joining the event. What works to support the mental health of young people leaving statutory social care in Wales? The Wales Doctoral Training Partnership, the Economic and Social Research Council (ESRC), and Welsh Government are offering a fully funded PhD opportunity. The collaborator, Health and Care Research Wales, will provide you with direct access to relevant policy-makers in Welsh Government. This close relationship between research and policy is a unique opportunity to ensure that your research has both relevance to and impact on social care practice. Applications are sought from candidates with backgrounds in social science (especially psychology, health services research, social care research). Experience or interest in realist approaches and both qualitative and quantitative research is desirable. Call for applications – Let’s celebrate your achievements! 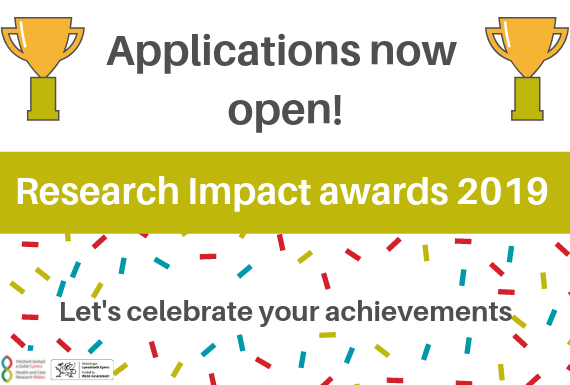 Nominations are now open for the Research Impact Awards 2019. Let’s showcase the hard-working, high-achieving staff from the Support and Delivery service that have made a difference to research and development in Wales. But we can only honour these research stars with your help. The annual conference will showcase the latest research and education in academic primary care from the UK and around the world in keynote presentations, parallel sessions of verbal presentations, posters, workshops and symposia. The programme will also feature lightning presentations (short 5 minute slots), poster pitches and a creative arts stream. This studentship is funded by the EU through the Knowledge Economy Skills Scholarships (KESS). The successful candidate will be looking at learning needs and preferences of NHS staff; approaches to education delivery and measuring changes in knowledge and attitudes. Wales and other countries are investing heavily to embed genomic healthcare within their health services and so this is a very timely study as staff education has, to date, lagged significantly behind investment in technological infrastructure. I’d encourage anyone with an interest in (health) workforce development and training, (adult) education or behaviour change to apply. The genomics education for NHS staff (that will occur alongside this PhD) will be delivered through Genomics Partnership Wales and so candidates do not need a background in genomics. We have a supervision team that includes an educationalist and a psychologist (who has worked with previously with the Director of Studies on behaviour change, genomics and the health workforce). Further information: Please see link below for further details or contact project supervisor Emma Tonkin: (emma.tonkin@southwales.ac.uk / 01443 483156). 'The Welsh ‘code-breaker’ making our visits to the GP safer' - looking at how analysis of patient safety incident records is being used to improve patient safety in primary care in Wales and beyond, led by Andrew Carson-Stevens is (pages 16-17). 'PRIME & Swansea Centre for Health Economics helping to improve community care services' - looking at the evaluation of the community based pathfinder service for treating Wet Age Related Macular Degeneration (Wet AMD) in the community, led by Rachel North (page 5). Low-dose computed tomography (LDCT) lung cancer screening has become the standard of care for high-risk groups in the US, and the case for implementation of stratified screening is building in the UK. Despite a 20% reduction in lung cancer mortality (Aberle et al, 2011), LDCT screening is not without harms, and in accordance with healthcare policy in Wales (Bradley et al, 2014; Atherton et al, 2016) patients need to be educated about the potential benefits, harms and limitations of screening so that they make a decision that is right for them. Lung cancer disproportionately affects individuals from disadvantaged communities in Wales, and if LDCT screening is to be introduced, we need to understand how we can best support disadvantaged populations to become involved in shared decision making regarding their lung screening decision in a way that avoids widening socioeconomic inequalities in lung cancer outcomes. The aim of the proposed PhD is to understand how we can best support shared decision making regarding low-dose computed tomography in high-risk disadvantaged populations in Wales, with a view to developing a patient decision support intervention. Adverse childhood experiences (ACEs) are potentially traumatic events that may have lasting effects on health and wellbeing. Exposure to ACEs has been shown to be associated with poor child and adult outcomes in high income countries, but very little is known about their burden or effects in low and middle income countries (LMICs) and whether they are important predictors of child outcomes once socio-economic status has been accounted for. Examine how ACEs might be understood and used in preventative public health programmes in LMICs. This project addresses the priority area antimicrobial resistance (AMR), which is a key public health threat. Use of antibiotics drives AMR and most antibiotics are prescribed in primary care. Previous research and antimicrobial stewardship activities have addressed overuse of antibiotics for many conditions, but antibiotic use of asthma exacerbations is under-researched. More than one in ten people have a diagnosis of asthma at some point. Most asthma exacerbations are not caused by bacterial infections, systematic reviews of poor quality studies have not found convincing evidence of benefit from antibiotic treatment, and guidelines recommend against antibiotic treatment, but around half of GP consultations for asthma exacerbations are treated with antibiotics. This project aims to better describe the use of antibiotics for asthma exacerbations (including children who are prescribed asthma medications but do not have a diagnosis of asthma), determine the effect of antibiotics on reducing serious outcomes such as pneumonia and hospital admissions in people with asthma exacerbations, and understand the factors leading to antibiotic prescribing for asthma exacerbations in primary care. 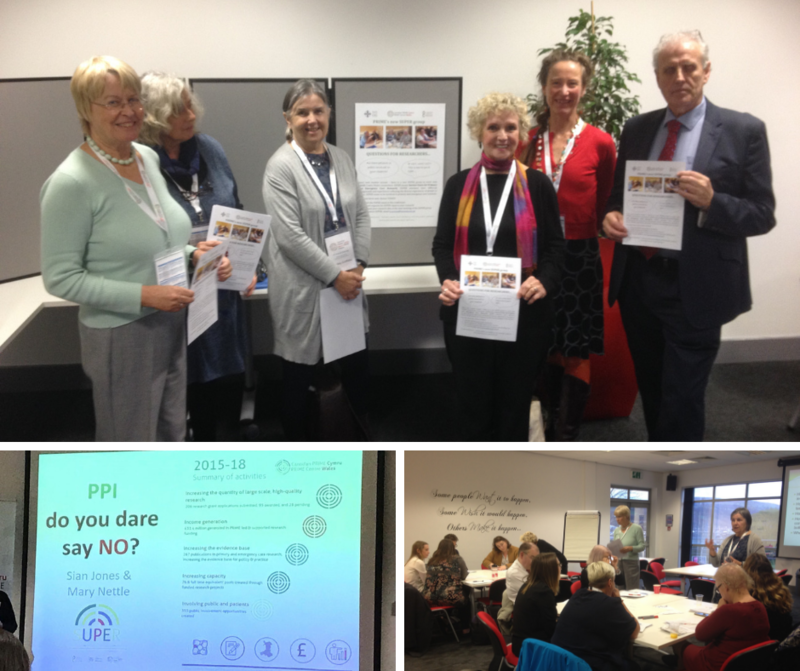 Public and patient members of the SUPER group supported the recent PRIME Annual Meeting held 26th November at University of South Wales Conference Centre. In a workshop called “Public and Patient Involvement: How can you improve your proposal and your research?” they explored why, who and how to involve patients and the public in developing research proposals. Workshop delegates then applied the information by working on an example research proposal, which provided opportunity for discussion and sharing experience. Members also presented an elevator pitch “SUPER research – Do you dare say no?”, challenging meeting attendees to consider whether public and patient involvement in research is a dangerous idea – do researchers dare not to use PPI to strengthen research quality or will they take the bigger risk by avoiding this resource which is open to all PRIME Centre Wales. SUPER (Service Users for Primary and Emergency care Research) invites researchers linked to PRIME to present their research at quarterly SUPER meetings for members’ feedback on scope, research methods and plans to involve public and patient members throughout the project. Future meetings are in March, June and September 2019. Dr Carolyn Wallace (PRIME Centre Wales Lead for Social Care research theme) and Professor David Pontin, of Centre for Research & Innovation in Care Sciences, University of South Wales and colleagues were prize winners at the University of South Wales Impact Awards 2018. The team was awarded prizes for 'Best Overall Impact' and 'Best Societal Impact'for their impact on policy and practice. The family resilience assessment instrument (FRAIT) has been incorporated into Welsh Government’s Healthy Child Wales Programme and is now used by health visitors across Wales. Partners in this project include Cwm Taf University Health Board, Hywel Dda University Health Board and Abertawe Bro Morgannwg University Health Board. This award was sponsored by Tata Steel. Read more. Professor Mark Llewellyn, Director of the Welsh Institute for Health and Social Care (WIHSC) at the University of South Wales (USW), will lead the team alongside Professor Fiona Verity, Director of the Wales School for Social Care Research. Dr Carolyn Wallace (pictured above), Reader in Integrated Care at University of South Wales and Lead for social acre research at PRIME Centre Wales is leading on the multiagency theme. Colleagues from Swansea University, Bangor University and Cardiff University will also work as partners in the study, which is being supported by PRIME Centre Wales. Read more. Congratulations to Victoria Shepherd, National Institute for Health Research (NIHR) doctoral research fellow at the Centre for Trials Research and PRIME Centre Wales, won the best poster award at the Health and Care Research Wales annual conference held 25th October. Commenting on the award, Victoria said: “I am delighted to have won the first ever best poster award at the Health and Care Research Wales conference. With over 330 of you in attendance at the SWALEC Stadium, Cardiff last week, the conference focused on the theme of future-proofing research in Wales with thought-provoking, interactive workshops and 35 speakers who discussed the role of Welsh research in shaping the treatment and care of the future. Read more. The All Wales Social Prescribing Research Network (WSPRN) have launched a new web page hosted by the Wales Council for Voluntary Action. The aim of the network is to build the critical evidence for social prescribing in Wales. It is a research platform to support the three communities of practice in North, West and East Wales. It is primarily a virtual network with face-to-face events across Wales. PRIME Centre Wales is proud to support WSPRN - Dr Carolyn Wallace, PRIME lead for Social Care collaboration and Reader in Integrated Care at the University of South Wales co-chairs the WSPRN Steering Group, with Judith Stone and Dr Sally Rees. Read about the latest research activities of PRIME Centre Wales - our annual report for 2017-18 is now available to view or download. The PRIME Centre Wales Patient Safety Research group were recognised as runner-up in the Health and Care Research Wales Public Involvement Award 2018, announced at the Health and Care Research Wales conference held 25th October. Dr Andy Carson-Stevens, lead for Patient safety research at PRIME, Mr Anthony Chuter, member of the public, and team received a special mention for their submission: ‘Patient safety research group: Improving patient safety in primary care’. The main prize was awarded to the National Centre for Mental Health (NCMH) for their pioneering work on public involvement in mental health research. Social Prescribing is a term which is growing in importance throughout our health and community services and within health and social care policy. It’s a term that few members of the public recognise; some reject it as the medicalisation of what should be a normal process of connecting people and for third sector organisations, it’s core business. Others are concerned that the systematic referral of ‘patients’ through social prescription models places pressure on community and neighbourhood resources, which may have a detrimental effect on volunteers and third sector organisations. Read full story. Against a background of controversy about the value of aspirin as a preventive in healthy subjects, a rather different use of the drug has recently been highlighted. Fifty years ago evidence suggestive of benefit from aspirin beyond the reduction of pain and fever, was reported. In two remarkable papers published in 1968 and 1973 Gabriel Gasic and colleagues described the role of platelets in the metastatic spread of cancer. They showed that a deficiency of platelets is associated with a reduction in the risk of cancer, and that experimentally-induced metastasis are reduced by aspirin. They concluded that these findings ‘strongly support the role of platelet aggregation and the platelet release reaction in metastasis’. Read more. Coproduction is an approach increasingly recognised across public services internationally. However, awareness of the term and the barriers and facilitators to its implementation in the NHS are not widely understood. This study examines clinician and public perceptions of coproduction within the context of the Prudent Healthcare initiative. This PRIME Centre Wales led study funded by Health and Care Research Wales has found that there is broadly positive perceptions among participants regarding coproduction, despite initial unfamiliarity with the term. The analysis may assist researchers and policymakers who are designing, implementing and evaluating interventions to promote coproduction. Read more. World Smile Day® 2018 – How dental research in Wales aims to bring a smile to your face! Smile and the world smiles with you - if you have good teeth. At the moment, many people visit the dentist every six months. However, this may not be the best use of patients’ time and money or NHS resources. Read the full story. We are delighted to announce that she has recently been successful in securing a Health and Care Research Wales Health Fellowship Award, which will allow her to conduct important research in pre-hospital care. Dr Khanom who is based at Swansea University Medical School is looking forward to starting the fellowship in October 2018 and it will last for three years. Read more. Dr Stephanie Smits is a behavioural scientist who works for PRIME Centre Wales and the Wales Cancer Research Centre in the area of screening, prevention and early diagnosis of cancer. We are delighted to hear that she has recently been successful in securing a Health and Care Research Wales Health Fellowship Award, which will allow her to continue her important research in bowel cancer.